While Sam and the police hunt for the gang, a second wave of meteors fall. Confident of victory against such feeble invaders, the gang grab weapons, mount bikes and mopeds, and set out to defend their turf. But this time, the creatures are bigger. Much bigger. Savage, shadowy and bestial, they are hunting their fallen comrade and nothing will stand in their way. The estate is about to become a battleground. And the bunch of no-hope kids who just attacked Sam are about to become her, and the block's, only hope. The feature film debut from Adam & Joe's Joe Cornish was inspired by his own experience of being mugged in London, drawing inspiration from a number of stylised American cult classics – from Assault on Precinct 13 to The Warriors – but remaining authentic to its very British location. The result is a gloriously witty and engagingly performed slice of comic science fiction, laced with a dark undercurrent of genuine menace. 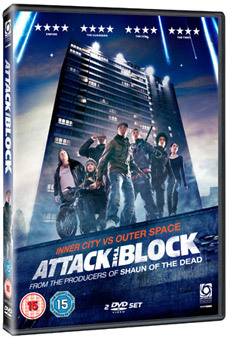 Attack the Block will be released on 2-disc DVD and Blu-ray (the latter as a double-play release containing DVD and Blu-ray versions of the film) on 19th September 2011 by Optimum Releasing at the RRP of £19.99 for the DVD and £24.99 for the Blu-ray/DVD pack.